In this world of capitalism, we may need a revolution! This is the seventh studio album by French band Nemo, a band whose music has entered in the progressive rock realm since the early 00s, and has maintained great expectations in every new release. The reason is simple, their music is great, so we are always waiting for some high-quality stuff. And this is not the exception, here we have an eight-song album with a total time of 62 minutes. The first track is a short introduction, “Liberté, égalité, Insurrection!” shares soft piano which later is accompanied by the other instruments. The structure is repeated over and over for two minutes, then it leads to “Je suis un objet” which is an explosive, dynamic progressive rock track. The rhythm is fast, vertiginous and attractive, I like the kind of funky guitar and how the vocals in French perfectly complement the music. The song flows and when you less realize, the five minutes full of a vast amount of elements, have finished. 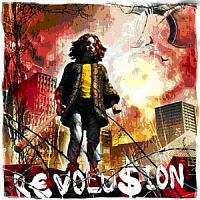 “Revolusion” continues with that vertigo, a sound that invites us to feel involved in the music. The keyboard is great at the beginning, creating a symphonic prog sound contrasted with some kind of heavy rock guitars, and even a catchy chorus. “Aux portes du paradise” is another short track, with two minutes of soft instrumental music that sounds a bit folkish and even new age, it is a beautiful track. “Seul dans la foule” on the other hand, is the first of the long compositions of this album, sharing almost nine minutes of excellent prog rock. The first minutes are really slow, a laid-back atmosphere, but then it begins to add new elements and to progress, until that tranquility disappears and a heavier sound reigns. But guess what, it is only for a moment because later it slows down once again, implementing a nice guitar riff over that mid-tempo bass and drums rhythm. Later, it progresses once again, the intensity increases and the song finishes with that heavy prog sound. “Chiens en laisse” has a cool soft sound with guitars and vocals, later there is a moment where they remind me of Gentle Giant due to the harmony vocals, and the second part is a bit heavier, with nice guitar riffs and a cool keyboard background. “Loin des yeux (Barbares VIII a XII)” is the most ambitious track here, a 24-minute song with an explosive start that lasts for more than two minutes, where the bombastic musician’s technique is evidently shown. Later the music slows down, with electronic drums and voice, and little by little it creates different passages, different pieces that seem not to fit in the same puzzle, however they do and are essential for the song’s success. I like a lot the faster moments, with heavy guitars and symph keyboards, but it is also worth mentioning that all the changes of mood, rhythm and style are well placed. That is why I say this is a complex, challenging and ambitious song, 24 minutes of a mixture of elements, of a prog eclecticism with a bagpipe highlight after 17 minutes. The album finishes with “Notes pour plus tard”, whose first three minutes are instrumental, with great use of both acoustic and electric guitars. The piano gives beauty, calm and tranquility, and then vocals enter with the same delicate style. A minute later the instrumental passages return, and the song flows and adds heavier moments in which one can feel Nemo’s energy. So this is the end of the story, this is a very good, strong album by Nemo, though I must admit it is not my favorite of theirs. My final grade will be four stars.